1 Department of Cardiology, Ca’ Foncello Hospital,Treviso,Italy.2Abbott Medical Italia, Agrate Brianza (MB),Italy. Pulmonary vein isolation (PVI) using contact force (CF) sensing ablation catheters currently relies on CF and force-time integral (FTI) guidelines. Such measurement of lesion effectiveness still lacks information on current delivery to the tissue, influenced by system impedance and power. Lesion Index (LSI) is a multi-parametric index incorporating CF and radiofrequency current data across time. We aimed to prospectively assess the efficacy of an LSI-guided approach to PVI in patients with paroxysmal atrial fibrillation (PAF). The study prospectively enrolled 28 consecutive patients with PAF undergoing PVI with a CF sensing catheter (TactiCathTM, Abbott). LSI-guided ablation target was adapted according to the mean regional thickness of pulmonary vein antra (PVA): LSI range 5.5-6 was pursued in the anterior and septal portions of PVA, 5-5.5 elsewhere. Data from 32 consecutive PAF patients who underwent PVI ablation with a non-CF guided approach (NCF-group) were retrospectively collected for comparison of procedural and clinical outcome. 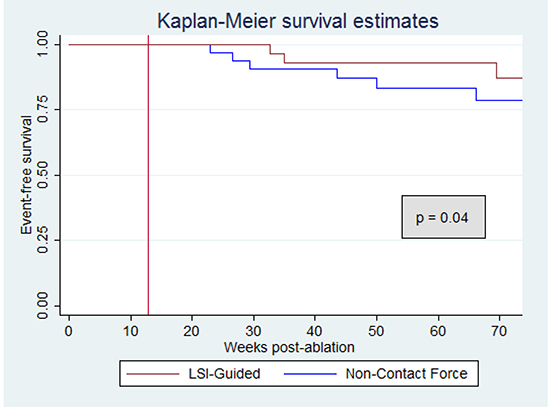 AF-free survival rate at follow-up (17±6 months) was higher for LSI-guided group than NCF-group (89.3% vs 65.6%, p=0.037), with no increase in periprocedural complication rate (no tamponades or other major adverse events reported). Among 1126 lesions with LSI within target range (5-6), average CF was >10g and <30g for 976 lesions (86.7%). Moreover, 1015 lesions (90.1%) had FTI>400gs, but with wide distribution: 30.2% within 400-500gs, 30.0% within 501-600gs, 29.9% over 600gs. In this first prospective study, LSI-guided PVI improved clinical outcome without any increase in complication rate when compared with standard, non-LSI-guided approach. Key Words : RadioFrequency Ablation, Contact Force, Lesion Index. The cornerstone of radiofrequency (RF) catheter ablation of paroxysmal atrial fibrillation (PAF) is pulmonary vein (PV) isolation (PVI) [1,2], which is achieved by creating contiguous, transmural lesions around the ostia of the PV. When AF recurs after PVI, it is frequently associated with the reconnection of conduction between PVs and the left atrium (LA)  due to inadequate lesions. Using standard irrigated catheters, parameters such as RF power, catheter tip temperature, impedance drop, and modification of the intracardiac signal are commonly exploited during RF delivery. However, these provide limited accuracy in assessing lesion quality. The use of contact force (CF)–sensing catheters enables stability and lesion depth to be controlled more precisely during point-by-point PV encircling, since no effective lesion is formed without adequate CF, and excessive CF is associated with excessive tissue heating and an increased risk of steam pop occurrence [4,5]. The feasibility and efficacy of CF monitoring during AF ablation have already been demonstrated in terms of reductions in procedural time, radiation exposure and the incidence of PV reconnection (PVR), and of increased success rates [6-8]. The formula combining CF and RF time - identified as the Force-Time-Integral (FTI) - can provide better real-time information on lesion depth and diameter than CF alone, thereby increasing the efficacy and safety of RF ablation [9,10]. However, FTI does not incorporate the important role of power delivery. Lesion Index (LSI) is a proprietary multi-parametric index that aggregates CF and RF current data across time during ablation. It could predict the extent of myocardial tissue lesions more accurately than FTI and guide AF ablation, thereby achieving better acute and long-term success rates. Retrospective studies on the correlation between procedural outcome and compliance with CF guidelines including LSI demonstrated a strong correlation of the index with PV durable isolation[12,13]. In clinical practice, differences in the frequency of PVRs and in clinical outcomes after PVI with and without CF monitoring have not yet been fully investigated. Acute and late PVRs still occur, and data on 1-year outcome are not consistent across studies. In the present study, we aimed to assess prospectively the efficacy of the LSI-guided approach to PVI in patients with PAF. Rates of acute PVI and 1-year success (defined as freedom from AF recurrence) using this approach were then compared with those recorded in a similar group of patients, retrospectively but consecutively recruited from our database of patients who had undergone a non-LSI-guided PVI procedure for PAF. In accordance with current guidelines, patients with symptomatic PAF (defined as ECG-proven episodes of AF which are self-limiting and last up to 7 days on each occurrence or which are electrically or pharmacologically cardioverted within 7 days) refractory to or intolerant of at least one antiarrhythmic drug were scheduled to undergo circumferential PVI. The exclusion criteria were: age under 18 years, previous AF catheter ablation, severe structural cardiac abnormalities and less than 6 months of follow-up after PVI. From June 2015, all patients undergoing PVI for PAF with a CF sensing catheter were followed up prospectively.All patients provided informed consent. The local institutional review committee approved the study protocol. Data from consecutive patients who had undergone PV ablation for PAF from October 2014 to June 2015, by means of a non-CF ablation catheter, were retrospectively collected and compared with those of the LSI-guided group. Prior to the ablation procedure, a transesophageal echocardiogram was routinely performed to assess the left atrial appendage (LAA) for thrombus, chamber size and dimensions and anatomical structures. Antiarrhythmic drugs (AAD) were discontinued at least five half-lives before the procedure. PVI was performed under conscious sedation. Intravenous heparin was administered at the time of trans-septal puncture, the target being an activated clotting time > 300 sec during the procedure. A deflectable multi-electrode catheter was positioned inside the coronary sinus (CS) via the left femoral vein. Access to the LA was obtained by means of a single trans-septal puncture.Via the right femoral vein access a circular decapolar catheter, Reflexion Spiral™ (Abbott) was then positioned in the LA through a 8.5-French long sheath (SL0, Abbott) and the irrigated ablation catheter (using either a fixed SL0 long sheath or a steerable AgilisTM, Abbot, sheath).All procedures were carried out with the aid of the EnSiteTM VelocityTM/PrecisionTM mapping system (MS), by using the One ModelTM software. In all patients, the geometry of the LA was reconstructed by alternately using both the circular and the ablation catheters. Continuous circumferential lesions were then created by using either a point-by-point (where RF energy was interrupted after the ablation target was achieved and before to move the catheter tip over the next LA antral segment) or a drag technique (where the catheter tip was moved to the next position after the ablation target was achieved but without interrupting RF delivery), guided by the circular mapping catheter and 3D MS. Lesion lines were created about 5 mm outside PV ostia, and all RF sites were tagged onto the 3D left atrial geometry on the MS. The ablation targets were to eliminate local near-field PV signals on the circular diagnostic catheter and to achieve bidirectional conduction block between the LA and PVs when standard pacing maneuvers were implemented. A 7-French 3.5 mm open-tip irrigated ablation catheter was used: TactiCathTM Quartz (Abbott). This catheter has a force sensor incorporated into its distal part; the sensor consists of a deformable body and 3 optical fibers that use infrared light to measure micro-deformations caused by forces applied to the tip of the catheter. Real-time CF, FTI and LSI values were monitored on the MS.
LSI is a novel ablation index that incorporates CF between the ablation tip and target tissue, applied current and duration of RF delivery, expressing the non-linear lesion formation due to the heterogeneity of concurring factors: resistive heating during the early phase and conductive heating during a later phase. The CF target ranged from 10 g to 30 g, in keeping with the recommendations that were established and validated after the EFFICAS I and II studies[10,14]. The LSI target was 5-5.5 in the posterior wall, roof and floor of PV antra, and 5.5-6 between the left PVs and LAA and in the septal portion, in accordance with reported data from a subgroup of TOCCASTAR12 and EFFICAS I patients13 and specific LA wall thickness15,16 (Figure 1). Figure 1 A and B. 1A)In the posterior wall, roof and floor of PVs, where the expected wall thickness was lower, LSI level ranging from 5 to 5.5 were targeted (bright red dots).1B)In the LA segments with thicker walls, such as the carina between the left PVs and the LAA and in the septal segments, the target LSI values ranged from 5.5 to 6 (brown dots). AutoMarkTM lesion color scale by LSI value is also shown on the left column. RF energy was delivered in a temperature-controlled mode (upper limit 42°C). The RF power output was limited to 25 W in the posterior wall and roof segments, and was set to 30 W during ablation of the anterior segments of the left PVs and the septal segments of the right PVs. These power sets were chosen to achieve an optimal safety profile and in accordance with the recommendations on the use of the TactiCathTM Quartz catheter.The location of each RF application along the isolation line was assigned to 1 of 4 predefined positions around each PV: posterior and anterior wall, roof and floor. All RF sites were tagged automatically onto the 3D left atrial geometry on the MS by means of the EnSite™ AutoMark™ module (Abbott), which is able to simultaneously record the catheter position, CF, FTI, LSI, start time of ablation, RF power, the number of ablations and the sequence of lesion deployment. The catheter tip stability was automatically addressed by the AutoMark™ module using three stability indexes: Average Contact Force, Constant Force and Stable Contact Force (where Average Contact Force is the average force to be considered as acceptable; Constant Contact represents the minimum force to be considered for contact versus no contact, providing feedback on the degree of intermittent contact; Stable Contact Force provides feedback on the degree of contact force variation over time, the time interval over which the stability of the force is analyzed: 3sec). RF lesions were deployed in a given segment only when all the three indicators target values were simultaneously reached (average CF > 10 grs, constant contact > 2 grs and stable CF < 7.5 grs). A new lesion tag was added by the MS to the ablation map when the automatically measured distance from the previous lesion was 5.5 mm or more (Marker Spacing was set > 5.5 mm), while the precise distance from the previous lesion was not available. A 3.5 mm tip (Thermocool™ Biosense Webster) or 4 mm tip FlexAbility™ (Abbott) irrigated ablation catheter was used with a SL0 sheath. Catheter stability before each RF application was confirmed by means of fluoroscopy. The RF power output ranged from 30 W, in posterior and roof portions, to 35 W in the anterior line of the left PVs and septal portion of right PVs. Each application of RF energy was delivered for 40 to 60 s, based on both impedance drop and modification of local intracardiac electrogram, with a maximum temperature of 42°C. We confirmed acute PVI in both groups by demonstrating entry and exit block by means of a 10-pole circular mapping catheter placed sequentially in each of the PVs. At least 30 minutes after electrical isolation of each PV, we performed a check to confirm bidirectional conduction block between the LA and PVs during sinus rhythm. In the event of reconnection, touch-up ablation was performed at the presumed site of the gap until PVI was obtained. 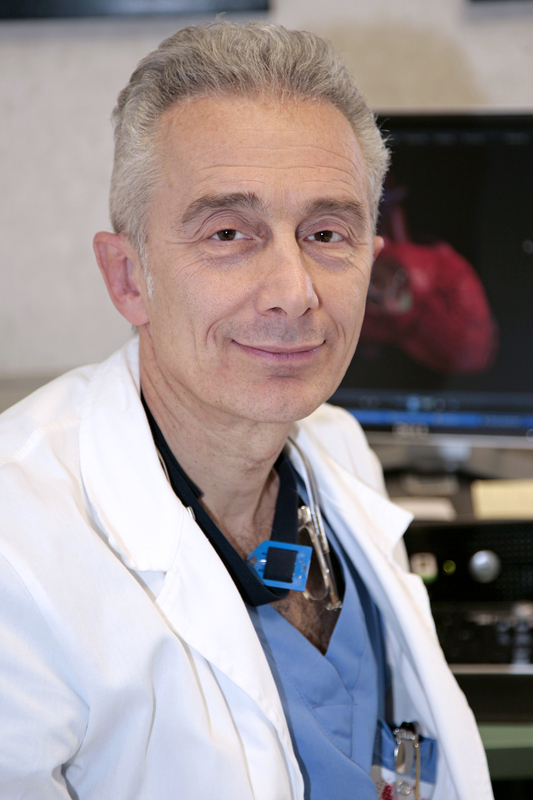 Only in the LSI-guided group the locations of touch-up lesions were tracked. AF recurrence was defined as any episode lasting at least 30 seconds that was documented by ECG during scheduled visits and by 24-h Holter, when available, or by reports from the emergency room when medical intervention was required. After a blanking period of 3 months following the procedure, antiarrhythmic therapy was resumed at the discretion of the treating physician. ECG Holter monitoring was performed after 3, 6 and 12 months and then every 6 months. Continuous variables were expressed as mean ± SD when normally distributed, while non-normally distributed data were reported as medians and interquartile ranges. For normally distributed data, comparative analyses were performed by means of Student’s t test for equal and unequal variances when appropriate. Statistical analyses on CF data were based on the analysis of variance tests (ANOVA and Kruskal-Wallis). Categorical variables were expressed as counts and percentages and were compared by means of the Chi-square test or Fisher exact test. A probability value (p) of < 0.05 was considered to be statistically significant. The statistical analyses were made by means of STATA 13.1 statistics software (StataCorp LP, College Station, TX, USA). Twenty-eight consecutive patients were enrolled in the LSI-guided group and compared with 32 historically treated patients (NCF group). [Table 1] summarizes the general demographics of the study population. There were no significant differences between the two treatment groups. Table 1. Characteristics of the patients and procedural details in non-contact force (NCF) and LSIguided groups. In the LSI-guided group, 1909 ablation records were available, 1797 (94.1%) of which were used for analysis; 112 RF applications (5.9%) lasting less than 6 seconds were excluded owing to poor catheter stability and tissue contact. An accurate description of the topographic distribution of CF, FTI and LSI parameters was obtained, as each RF application was assigned to one of the 4 specific anatomic locations around each PV (anterior, posterior, roof and floor), as previously mentioned. In line with the protocol, higher LSI values were reached in the anterior and septal segments (median LSI = 5.7 [5.3-6]) than in the posterior wall (median LSI = 5.3 [4.9-5.6], p <0.001) and roof (median LSI 5.5 [5-5.9], p = <0.001). Figure 2. Box-plots by pulmonary vein for LSI (upper panel), CF (middle panel), FTI (lower panel). Table 2. Regional mean, median and interquartile range (IQR) values of CF, FTI and LSI. Among the total number of analyzed lesions, 1126 had an LSI value within the target range (5-6). Considering each vein separately, average LSI still depended on the specific target for each segment, as expected per-protocol (Figure 2, upper panel). Average CF was > 10 g and < 30 g for 976 lesions (86.7%) and in by-vein analysis it ranged 10 to 20 g in all segments (Figure 2, middle panel). Moreover, 1015 out of 1126 lesions (90.1%) had an FTI > 400 gs, but a wide distribution was noted: 30.2% of the lesion had a FTI between 400-500 gs, 30.0% in the range 501-600 gs and 29.9% over 600 gs (Figure 3). 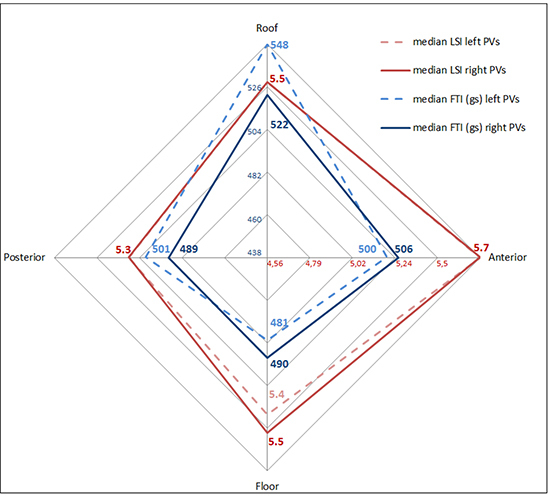 FTI values recorded during RF ablation of the same segment of the PV antra varied significantly between the four veins (Figure 2, bottom; roof FTI values comparison between LSPV, LIPV, RSPV and RIPV: p = 0.02; anterior segment FTI: p = 0.03; floor FTI: p = 0.02; posterior segment FTI: p = 0.02). Figure 3. 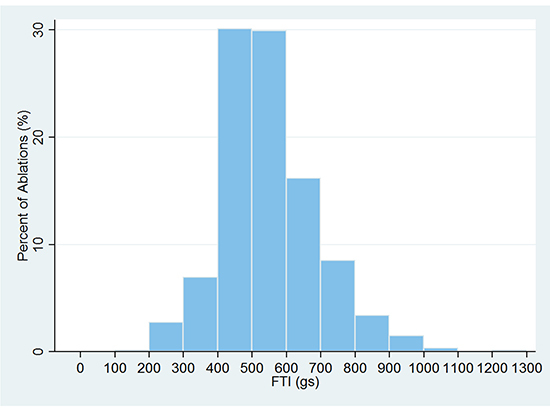 Histogram of FTI values of the 1126 lesions with the same LSI target range between 5 and 6. Note that even if about 90% of the lesions had FTI values above 400 gs (as recommended by current guidelines), the FTI values showed a broad range of variation (ranging from 200 to 1100 gs). All PVs were checked for bidirectional block at least 30 minutes after successful isolation. Acute reconnection data were available only in the LSI-guided group; in 24 patients (85.7%), no gap was detected on remapping. In the remaining 4 cases (14.3%), PVs were re-isolated. Of 104 PVs targeted, 5 (4.8%) required a touch-up ablation at the end of the procedure: 3 right superior PVs, 1 left inferior PV, 1 right inferior PV. Gaps were found in 4 types of segments: septal RSPV antra (in 2 patients), anterior portion of LIPV, floor of RIPV and posterior wall of RSPV. The roof region of PV antra never showed early reconnection. 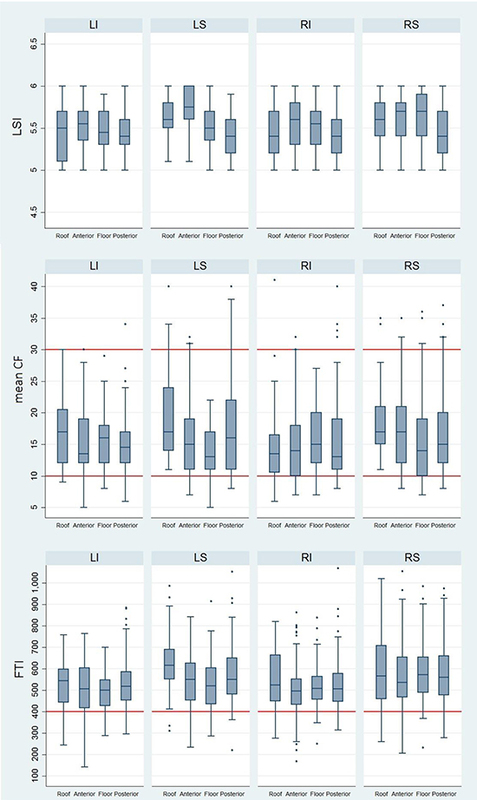 No significant differences were found in average values of CF, FTI or LSI values in areas of reconnection compared with sites of successful one-shot RF. The number of RF lesions in each area and the continuity of lesion deployment were not considered in this analysis. The mean procedure time was similar in both groups (180.9 ± 48.7 min. in the LSI-guided group vs. 200 ± 28.3 in the NCF group, p = 0.07). Although total RF time was similar (see Table 1), the number of RF applications was higher in the LSI-guided group (40.3 ± 12.8 vs 30.2 ± 9.8, p = 0.002). Fluoroscopy time was significantly shorter in the LSI-guided group (20.1 ± 7.4 min vs 29.1 ± 11.2, p < 0.001). No tamponades or other major adverse events related to catheter ablation were reported. A groin hematoma occurred in one NCF group patient; in LSI-guided group, one arteriovenous fistula and one mild pericardial effusion not requiring pericardiocentesis were reported. Clinical outcomes were evaluated in both groups after a mean follow-up (FUP) of 72 ± 28 weeks (mean FUP of 71.1 ± 29.7 weeks in the NCF group vs. 73.1 ± 26.5 weeks in the LSI-guided group, p = 0.78, maximum FUP of 120 weeks for both groups). Global AF-free survival on follow-up differed significantly between the two groups (NCF: 65.6%; LSI-guided: 89.3%; p = 0.037). Kaplan-Meier survival curves are shown in [Figure 4]. Time-to-event was comparable (65.6 ± 32.1 weeks in the NCF group; 45.8 ± 20.6 weeks in the LSI-guided group, p = 0.34). In the NCF group, 21 (65.6%) patients were off any AAD at the latest follow-up visit vs. 24 (85.7%) in the LSI-guided group (p = 0.073). Among these, 18 patients (85.7%) in the NCF group and 22 (91.7%) in the LSI-guided group were in sinus rhythm on FUP (p = 0.65). Figure 4. Kaplan–Meier curves of the two groups’ AF-free survival and Log-Rank test p-value. The main finding of our study is that, in PAF ablation, a LSI-guided approach is safe and effective, with a 89.3% success rate after a mean FUP of over 17 months.Current guidelines on the use of fiberoptic CF-sensing catheters for PVI indicate a minimum FTI target value of 400 gs for each RF application. Other authors advocate lower FTI values for PVI, but these data were derived using electromagnetic CF-sensing ablation catheters. As demonstrated by Bourier et al, fibertoptic and electromagnetic CF sensing catheter may show different accuracy in CF measurement, with the latter technology being possibly less accurate in measurements of 90° degrees acting forces (parallel contact, which is often required when creating linear lesion as in the case of PVI). [20,21] Therefore, since FTI is derived from a simple multiplication of CF by time, data obtained using electromagnetic CF-sensing catheters should be compared with caution with data derived using fiberoptic catheters. However, the use of FTI as an index of lesion efficacy suffers several limitations since it does not take into account multiple factors, such as the power delivered to the tissue, the impedance of the system and the complexity of lesion formation. LSI is a complex metric that combines RF current, RF duration and CF applied to cardiac tissue into a non-linear formula, thus providing a comprehensive description of lesion quality. In-vitro testing showed not only a good correlation between LSI and lesion depth and width, but also suggested that LSI could be considered as an objective and absolute index of lesion size, since its reliability is consistent across different values of CF and RF . The LSI clinical significance was initially evaluated in the EFFICAS I study: its correlation with PVR and lesion gaps 3 months after PVI was 10 times stronger than that of FTI . Limited data are available regarding which LSI values should be targeted in order to achieve a permanent lesion without any increase in complication rates. In a subgroup study of TOCCASTAR patients, Mansour et al. found the greatest improvement in PVI rate (80% vs. 46%, p = 0.004) in subjects treated with LSI > 5, combined with CF > 20g and FTI > 400gs. As the transmural thickness of the LA is not uniform and since it has been demonstrated that the posterior wall and roof are significantly thinner than the anterior and septal walls, setting different LSI targets (higher for anterior wall and lower for posterior wall) is reasonable and justified, in order to ensure both safety and efficacy. Consequently, considering the few data available on the influence of LSI parameter on PV reconnection, we established an optimal LSI target range between 5 and 6, according to each specific anatomical location. In the present study, higher LSI values were targeted in the anterior and septal segments (target 5.5-6) than in the posterior wall and roof (target 5-5.5) (Figure 1). This choice is further justified by the results of EFFICAS II, where more gaps were reported in the anterior portions of PVs, in a scenario in which only CF and FTI guidelines were observed. In this study, CF remained between 10 and 20 g in the vast majority of RF applications. In standard ablation procedures, by contrast, the available literature reports high variability in the applied CF, depending on the accessibility of the ablation site.Moreover, most of the LSI-guided lesions fulfilled the criterion of FTI > 400 gs, but with a wide range of distribution, to the point that 29.9% of lesions required FTI values > 600 gs to achieve the target LSI (Figure 3). The FTI > 400 gs criterion alone, as in EFFICAS II study protocol, is not precise enough to define lesion quality, since it does not provide any indication about a maximum target value. LSI values distribution was not similar to that of FTI, either around the left or right PV antra (Figure 5). This finding may be explained considering that, as previously mentioned, LSI reflects the amount of RF energy delivered to the cardiac tissue, which is in turn influenced by power, adequately titrated according to the area. However, it is also influenced by other factors, which cannot be directly measured in a complex and varying clinical scenario, e.g. the overall impedance of the ablation system. Therefore, as shown in vitro, LSI should constitute a more reliable predictor of lesion width and depth, regardless of the amount of delivered RF power. Figure 5. Radar chart to represent the distribution of average LSI and FTI values per PV segment. Ideally, the local LSI target value should be customized to the patient-specific LA wall thickness in each PV segment, if such information was routinely available with adequate precision (e.g. by means of cardiac MRI or CT scan imaging techniques). A 33% reconnection rate after successful PVI is reported. Das et al. reported a 26% rate of acute recurrence of electrical conduction after ipsilateral PVI when adequate CF was achieved.In the present study, in the LSI-guided group, touch-up lesions 30 minutes after successful isolation were necessary in 4.8% of the veins. The low incidence of acute reconnection did not allow in-depth statistical analysis on the influence of average CF, FTI and LSI values on the presence of gaps. However, considering reconnection rates reported by the literature, LSI may provide an aid to achieving one-shot transmurality more effectively than non-CF parameters or CF alone. The number of RF applications delivered was higher in the LSI-guided group, while the total RF duration was similar in both groups. This could be explained primarily by the fact that accurate monitoring of LSI values may have encouraged the adoption of a point-by-point ablation technique. Secondly, while RF time was comparable between the two groups, lower power settings were adopted in the LSI-guided group, thereby ensuring greater safety without affecting efficacy, as previously reported. In line with other experiences[6,7] fluoroscopic exposure time resulted significantly lower in the CF group, since the use of fluoroscopy to confirm catheter contact and stability could often be avoided.These results broaden the growing body of literature supporting CF-guided ablation [18,19].They also extend the comparison of technologies, potentially improving the current CF guidelines by promoting an objective and absolute method of ensuring the effectiveness of RF lesions deployment. LSI incorporates multiple variables, such as current, time and CF, and delivers this complex information in one intuitive index, which is both applicable and reliable in clinical practice. The small study sample does not allow to draw definite conclusions about the safety of an LSI-guided PVI approach. Although no tamponades or other major complications were reported, further studies are needed to assess the potential safety improvement. The limited ECG monitoring during follow-up and the use of 24-h instead of 7-day Holter or other continuous monitoring devices might have failed to detect asymptomatic AF recurrences; consequently, ablation success rates might have been overestimated. However, as there was no difference in the monitoring protocol between the two study groups, any potential bias would have been small. The comparison between the two groups is neither randomized nor parallel and several other biases may have influenced outcomes: contact force information alone, operator experience and learning curve. Moreover, a steerable sheath was used almost exclusively in patients of the LSI-guided group: it is the authors opinion that the use of such a stiff sheath in the absence of any contact-force feedback in the NCF group would have result harmful. The aim of the comparison between the two ablation strategies was to investigate whether an LSI-guided ablation strategy using a CF ablation catheter, could improve the procedural outcome of PAF ablation in a single center. More robust data on the safety and effectiveness of LSI-guided PVI in patients with PAF should be obtained from larger randomized trials with longer follow-up in order to confirm our results. LSI is a multi-parametric index which incorporates time, current and CF data during RF ablation. This is the first study to prospectively evaluate the LSI-guided approach to PVI. This approach improved clinical outcome and was not associated with any increase in complication rate when compared with standard, non-LSI-guided PVI. The authors are grateful to Franco Noventa (Senior Scientist, Department of Molecular Medicine, University of Padua, Italy) for the statistical analysis. Calkins Hugh, HindricksGerhard, CappatoRiccardo, KimYoung-Hoon, SaadEduardo B, AguinagaLuis, AkarJoseph G, BadhwarVinay, BrugadaJosep, CammJohn, ChenPeng-Sheng, ChenShih-Ann, ChungMina K, NielsenJens Cosedis, CurtisAnne B, DaviesD Wyn, DayJohn D, d'AvilaAndré, de GrootN M S Natasja, Di BiaseLuigi, DuytschaeverMattias, EdgertonJames R, EllenbogenKenneth A, EllinorPatrick T, ErnstSabine, FenelonGuilherme, GerstenfeldEdward P, HainesDavid E, HaissaguerreMichel, HelmRobert H, HylekElaine, JackmanWarren M, JalifeJose, KalmanJonathan M, KautznerJosef, KottkampHans, KuckKarl Heinz, KumagaiKoichiro, LeeRichard, LewalterThorsten, LindsayBruce D, MacleLaurent, MansourMoussa, MarchlinskiFrancis E, MichaudGregory F, NakagawaHiroshi, NataleAndrea, NattelStanley, OkumuraKen, PackerDouglas, PokushalovEvgeny, ReynoldsMatthew R, SandersPrashanthan, ScanavaccaMauricio, SchillingRichard, TondoClaudio, TsaoHsuan-Ming, VermaAtul, WilberDavid J, YamaneTeiichi. 2017 HRS/EHRA/ECAS/APHRS/SOLAECE expert consensus statement on catheter and surgical ablation of atrial fibrillation: Executive summary. Europace. 2018;20 (1):157–208. Verma Atul, KilicaslanFethi, PisanoEnnio, MarroucheNassir F, FanelliRaffaele, BrachmannJohannes, GeuntherJens, PotenzaDomenico, MartinDavid O, CummingsJennifer, BurkhardtJ David, SalibaWalid, SchweikertRobert A, NataleAndrea. Response of atrial fibrillation to pulmonary vein antrum isolation is directly related to resumption and delay of pulmonary vein conduction. Circulation. 2005;112 (5):627–35. Yokoyama Katsuaki, NakagawaHiroshi, ShahDipen C, LambertHendrik, LeoGiovanni, AebyNicolas, IkedaAtsushi, PithaJan V, SharmaTushar, LazzaraRalph, JackmanWarren M. Novel contact force sensor incorporated in irrigated radiofrequency ablation catheter predicts lesion size and incidence of steam pop and thrombus. Circ Arrhythm Electrophysiol. 2008;1 (5):354–62. Thiagalingam Aravinda, D'AvilaAndre, FoleyLori, GuerreroJ Luis, LambertHendrik, LeoGiovanni, RuskinJeremy N, ReddyVivek Y. Importance of catheter contact force during irrigated radiofrequency ablation: evaluation in a porcine ex vivo model using a force-sensing catheter. J. Cardiovasc. Electrophysiol. 2010;21 (7):806–11. Kimura Masaomi, SasakiShingo, OwadaShingen, HoriuchiDaisuke, SasakiKenichi, ItohTaihei, IshidaYuji, KinjoTakahiko, TomitaHirofumi, OkumuraKen. Comparison of lesion formation between contact force-guided and non-guided circumferential pulmonary vein isolation: a prospective, randomized study. Heart Rhythm. 2014;11 (6):984–91. Marijon Eloi, FazaaSamia, NarayananKumar, Guy-MoyatBenoit, BouzemanAbdeslam, ProvidenciaRui, TreguerFrederic, CombesNicolas, BortoneAgustin, BovedaSerge, CombesStephane, AlbenqueJean-Paul. Real-time contact force sensing for pulmonary vein isolation in the setting of paroxysmal atrial fibrillation: procedural and 1-year results. J. Cardiovasc. Electrophysiol. 2014;25 (2):130–7. Reddy Vivek Y, ShahDipen, KautznerJosef, SchmidtBoris, SaoudiNadir, HerreraClaudia, JaïsPierre, HindricksGerhard, PeichlPetr, YulzariAude, LambertHendrik, NeuzilPetr, NataleAndrea, KuckKarl-Heinz. The relationship between contact force and clinical outcome during radiofrequency catheter ablation of atrial fibrillation in the TOCCATA study. Heart Rhythm. 2012;9 (11):1789–95. Calzolari Vittorio, De MattiaLuca, IndianiStefano, CrosatoMartino, FurlanettoAlberto, LicciardelloClaudia, SquasiPaolo Antonio Maria, OlivariZoran. In Vitro Validation of the Lesion Size Index to Predict Lesion Width and Depth After Irrigated Radiofrequency Ablation in a Porcine Model. JACC Clin Electrophysiol. 2017;3 (10):1126–1135. Mansour M, ShahD, KalbfleischS, JordaensL, KautznerJ, KuckKH. Application of contact force guidelines increases durable isolation after pulmonary vein isolation for paroxysmal atrial fibrillation. Heart Rhythm, Supplement. 2013;10:5–0. Neuzil P, KuckKH, NakagawaH, KautznerJ, ShahD, FremontO. Lesion size index for prediction of reconnection risk following RF ablation for PVI. Heart Rhythm, Supplement. 2012;9:5–0. Ho Siew Yen, CabreraJosé Angel, Sanchez-QuintanaDamian. Left atrial anatomy revisited. Circ Arrhythm Electrophysiol. 2012;5 (1):220–8. Hall Burr, JeevananthamVinodh, SimonRochelle, FilipponeJohn, VorobiofGabriel, DaubertJames. Variation in left atrial transmural wall thickness at sites commonly targeted for ablation of atrial fibrillation. J Interv Card Electrophysiol. 2006;17 (2):127–32. Das Moloy, LovedayJonathan J, WynnGareth J, GomesSean, SaeedYawer, BonnettLaura J, WaktareJohan E P, ToddDerick M, HallMark C S, SnowdonRichard L, ModiSimon, GuptaDhiraj. Ablation index, a novel marker of ablation lesion quality: prediction of pulmonary vein reconnection at repeat electrophysiology study and regional differences in target values. Europace. 2017;19 (5):775–783.